Ah – these words that fill so many of us with guilt. These words, they should fill us with great joy and a sense of fulfilment and excitement, but we never manage to meet our own expectation enough for that to be our reality. And at this time of the year we start setting New Years resolutions with those words in them, and that fear of a new wave of guilt at the inevitable failure start to creep in again. Words like “Quiet Time” & “Personal Devotions” and all the other phrases that we interpreted to mean “you need to learn about God and get to know Him all on your own, without any support”. For many of us, these expectations have lead to an lack of understanding of God and unfulfilled relationship with Him. Many of us find it a challenge to learn and engage and concentrate by ourselves. Not just in Bible study, but in all areas of our lives. We find it much easier to learn in community, in collaboration with others, by discussing and questioning and pondering things together. And this was true even before the cultural shift toward an always-on, hyper-connected environment. We like to blame social media and the rise of technology for our inability to focus – but many of us had this problem well before we had a smartphone in our pocket. People like us were created to learn in community. No wonder we’ve struggled all these years to stick to the discipline “quiet times”! Yet, we still have traditional expectations of what “personal” and “quiet” Bible study should look like, which can put us on a path of dis-engagement and guilt. In my opinion, quiet times aren’t always meant to be hidden or alone, and devotions aren’t meant to just be personal. 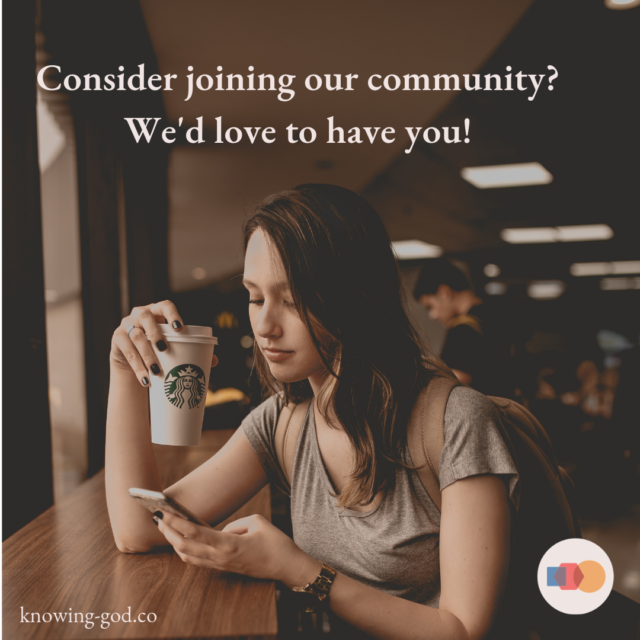 Exploring the Bible can also be done in community, with people who can encourage us, support us, share their revelations and learnings with us, get curious with us and keep us accountable. So my “revelation” is that I need to reframe my expectations of what Bible study looks like for me. I need the right ingredients for me. What are they? I figure I need these three key things. Great Bible based teaching that helps be know God through His Word. I need this Bible study to come into my digital world the same way the other things I spend time reading do (the news, my friends messages etc). I need a group of people to learn with. I need discussion. I need to be able to ask questions, and I need to see questions be asked to help me think about the teaching from different perspectives than my own. 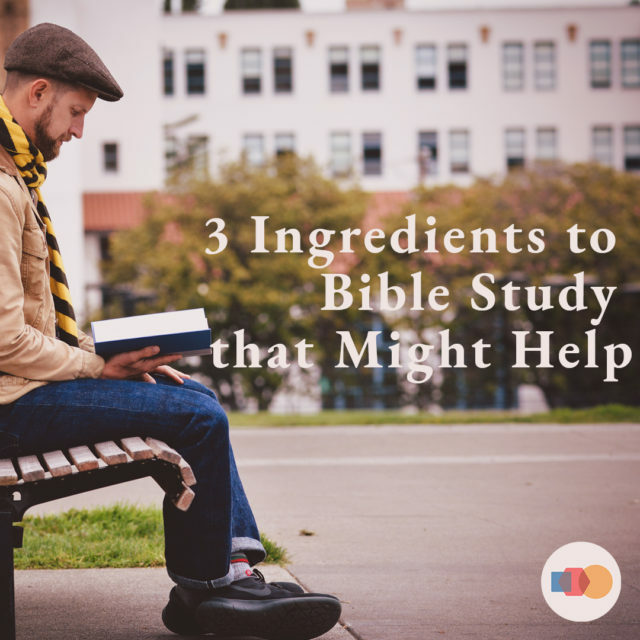 So, I created Knowing God – the combination of all three of these ingredients; A Bible study sent to me just like everything else (online), coupled with a community of people who are going on this same journey with me. The Knowing God studies were written by my grandfather, G. Milton Smith. They take you on a four year devotional journey throughout the Bible – chronologically, so you get the full context of what is going on (you’ll be surprised just how much this helps!). In these studies, the deep things of God are unfolded in simple language, helping make the Word of God relevant to everyday living. I’ve sought to combine this work into a online service that fulfils the other two ingredients that I see as essential for daily Bible study (for people like me). You get your daily study delivered to you each morning on Facebook Messenger and/or to your email. One click away and you’re at your day’s study – with the Bible reading (in a selection of translations) waiting for you, along with your teaching for the day. This means the study comes to me, and is part of my normal daily routine. I don’t have to remember to go to my study and do my reading – I read it as though I read the news, or an article a friend sent me. The community is the final ingredient. On each study page there is the opportunity to tell your study group what you learned, thought, ponder, question or wonder. And, everyone is encouraged to reply to and encourage a couple of other people in their comments (which means you’ll likely have people replying and encouraging you, too!). In addition to this there is a private Facebook group. Why? If we are struggling to keep up with the studies, we can still be connected to our community who are there to be a support network for each other and to help each other when the going gets tough. So, if you are thinking about getting into the Bible (again), but dread trying to do it all by yourself (again), then why not try doing with a group of people who just need someone like you to do it with?